- 1. Change out images easily to create a new style of Holiday decor any time you want. Pin reminders, inspirational quotes or photos from last weekend all in one flexible space. - 2. Use it at a wedding ceremony or birthday party as a seating plan display or a place for guests to write their well wishes. Showcase photos of special memories from the past for guests to enjoy during cocktail hour. - 3. Instead of hiding your favor photos in an album or on your phone, use it to display your personal photo collage as a beautiful wall display in your home, office or dorm room. - 4. Forget the scissors and glue, and present your photos in a space where they can be enjoyed by many. 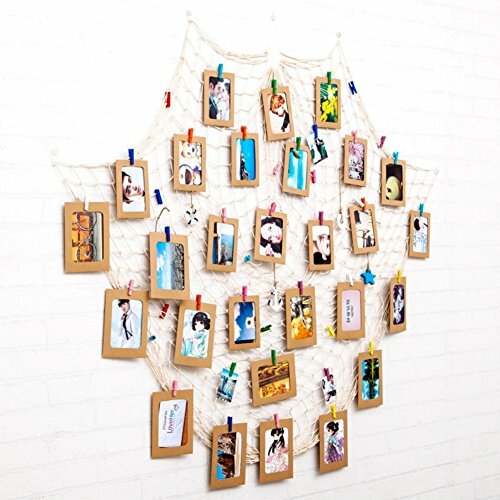 - 5. our string light comes with 40, much more than only 20 photo clips from others, which can cover more artworks and photos. - 6. low power consumption and low heat emission, no worry about burning and safe in operation. ✔ Tell your story to your friends, lovers and family in this creative romantic way. Note: The shells on the fishing net can be taken off. Unique Design: An artistic way to display your Photo wall, Photos, Christmas cards, stockings, mementos, making them a wall decor essential for your living room, bedroom and dorm room. DIY Assembly: According to the size of the wall to adjust the net put way, everyone can make different way. Wide Application: You can use with some bright color of starfish, conch and other items, it will bring you more better effect. Wonderful Decoration: Decorative your garden, porch, living room, bedroom, even the party with the string light to add a beautiful glow to your life. Size: approx. 200cm x 100cm/79 x 40 inch, the net is flexible enough to fit most walls. If you have any questions about this product by Wenasi, contact us by completing and submitting the form below. If you are looking for a specif part number, please include it with your message.